Less has been written about our very own GM Wesley So PHI as the current 8th youngest ever to barged into FIDE’s International Grandmaster (GM) rank. This he accomplished on December 7, 2007 at the age of 14 years, 1 month and 28 days to become the seventh youngest GM in history during that time. Additionally, as of January 2011 FIDE Rating, Wesley So with an ELO of 2673 is now ranked 3rd among the World’s Top Juniors. GMs Fabiano Caruana ITA(2721) and Anish Giri NED(2686) are 1st & 2nd respectively. 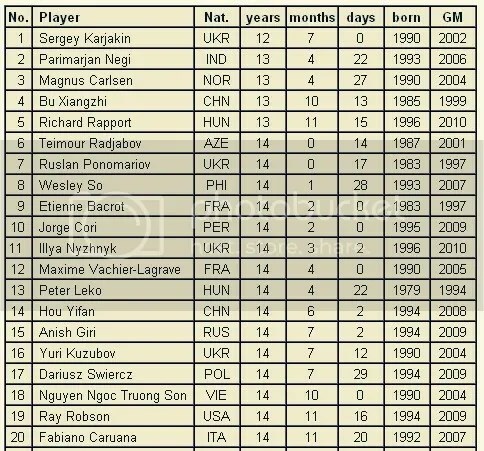 In the recently published “FIDE Rating of Top Junior Players by Age (February 2011)” by Chessbase.com on 05.02.2011, GM Wesley So, was among the top six elite junior players in Chess history that registered high ratings in their Junior’s years (19 years old & below) See chart below. The chart produced by Sander van Noort is about strength-to-age scale. This reflects how strong the juniors were at different ages. 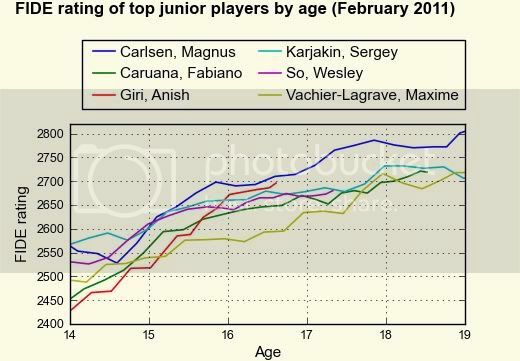 It also describes the latest ratings of the top junior players plotted against the age at which they reached them. The chart already includes the latest results from Tata Steel Chess 2011. As we can see Wesley So (born Oct 9, 1993) was the youngest to breached the 2600 mark. Officially, he did it on October 2008 FIDE rating list with 2610 ELO at the age of 14 yrs 11 months and 22 days. Magnus Carlsen (born Nov 30, 1990) was second-youngest and made it at the age of 15 years and 31 days on January 2006 FIDE list with 2625 ELO. Sergey Karjakin (born Jan 12, 1990) was 3rd and he did it on April 2005 FIDE List with 2635 ELO at age 15 yrs 2 months and 19 days. Based on AGE, on or before they turned 15 years old , officially, Wesley So was 1st with 2610 ELO (Oct 2008 FIDE rating), Sergey Karjakin was 2nd with 2599 ELO (Jan 2005 FIDE rating) and Magnus Carlsen was 3rd with 2560 ELO (Oct 2005). From AGE 15 onward, Magnus Carlsen was the highest ever (1st to break the 2700 & 2800 ELO barrier) with Anish Giri (born June 28, 1994) the youngest among the six players was impressively surging to 2nd place starting before he turned 16 years old. With his Live Rating @ 2696.3 after Tata Steel Chess 2011 Grp “A” scoring 6.5/13 with a Tournament Performance Rating (TPR) of 2744, Anish Giri is the second-strongest sixteen-year-old in history, Sergey Karjakin third, Wesley So fourth, Fabiano Caruana (born July 30, 1992) fifth & Maxime Vachier-Lagrave (born Oct 21, 1990) at sixth strongest. My response to their kibitz @ CG was … Pls take note … Karjakin born Jan 12, 1990 starting @ age 19, his ELO went down to 2706 (Jan 2009). By then, he decided to transfer to Russia from Ukraine. His decision as reported by chessvibes.com was “mostly because of the coaches. And I also need to train with good coaches and there are a few good coaches in Russia, for example Yuri Dokhoian, who worked with Garry Kasparov and now in this tournament he is working with me”. Additionally, he said … “This decision was made because I didn’t have enough support inside the country, in Ukraine”. This decision produced remarkable results since then, and as of January 2011 Karjakin FIDE ELO went up @ alltime high of 2776 and ranked 5th in the world. Therefore, Karjakin formula was completely accurate ! Going back to Wesley So, as Rusticbull also a ka-BW @ CG wrote “Reason to celebrate” in his blog @ chesswindows.blogspot.com … “the global Filipino chess community has all the reasons to celebrate … Wesley continues to give us the reason” !! !